This black bean corn salad recipe always reminds me of my mother-in-law, Mary. Over the years, Mary assembled copies of her favorite recipes in a three-ring binder and created a similar one for my wife, Shae, after she graduated college. From this collection, Shae had one recipe on near-constant rotation: turkey loaf. I wasn’t a vegetarian when Shae and I met, and I’ll admit that “the loaf” was tasty, but it was time to shake things up. So I used Mary’s suggested recipes binder to slowly branch out our weekly meals and get some new flavors into the rotation. 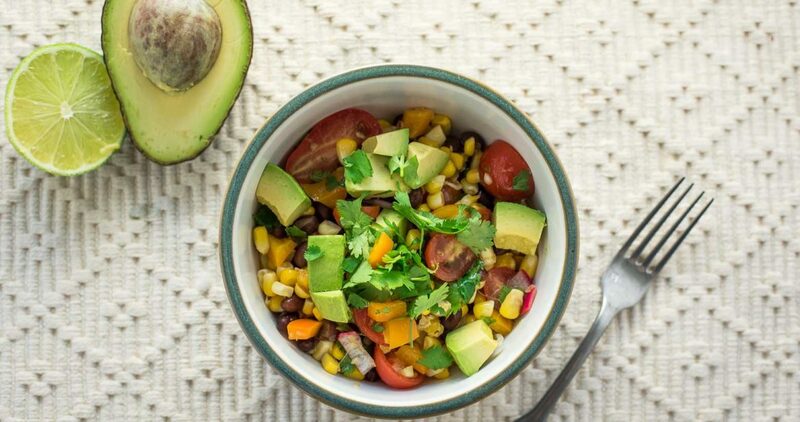 Enter delicious, fresh black bean corn salad! I knew this was a good one when I found it in the recipe binder because it had Mary’s trademark “excellent” scrawled in cursive and underlined. To be fair, for a recipe to make the cut and be included in the binder, it needed to contain a “very good” or “excellent” statement. But few were underlined! The secret language of mom scrawls! Look for the underline, y’all. The emphasis is everything. This black bean corn salad is fresh, delicious, and easy to make. It’s a great summer meal and can be served warm or cold. We like it as a main dish but it would also be a delicious side. You can also treat it as a dip and pair it with tortilla chips. So flexible! Going with the summer vibes here. Keep it light and keep it fresh. 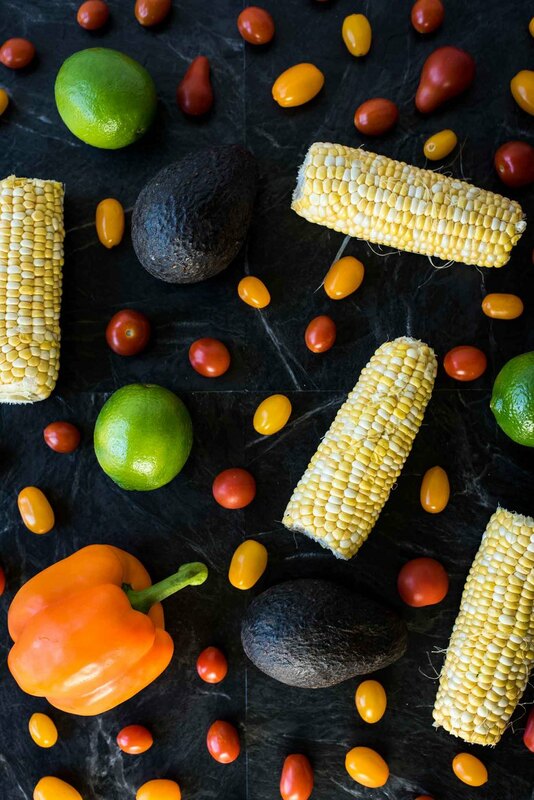 You can pair wines with this black bean corn salad with an eye towards the corn, black beans, or tangy lime chili dressing. Chenin Blanc – Apple, pear, lemon, and lime. Fruit-forward, a little sweet, and crisp. Good choice if you turn up the chili powder in the dressing. Chardonnay – Unoaked. You wanted the clean crispness of the fruit, not a buttery overload from oaking. Let that corn shine! 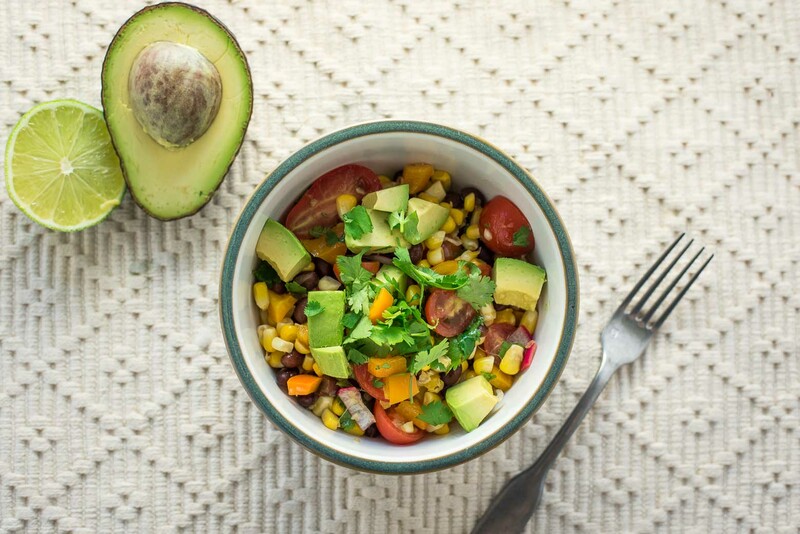 Easy, fresh, and delicious black bean corn salad recipe. Eat cold for a light and tasty summer meal or heat it up for some winter warmth. To make the dressing, smash the garlic cloves using the side of a large, flat knife (or mortar and pestle). Once smashed, sprinkle with pinch of salt. Continue using the knife to press and smear the garlic until it becomes a thick paste consistency. Once paste consistency is achieved, add garlic paste to small mixing bowl with lime juice, remaining salt, and chili powder. Add olive oil slowly to ensure consistent mixing. 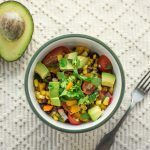 To make the black bean corn salad, cook the corn, bell pepper, and onions in olive oil over medium heat in a skillet, about 3-5 minutes or until beginning to brown. Once beginning to brown, add black beans until warmed. When warmed, add dressing until vegetables and beans are evenly coated. Remove from heat. Gently fold in cherry tomatoes, avocado, and cilantro, reserving some avocado and cilantro for topping. Best when fresh. Can be stored in refrigerator up to 3 days. Avocado might brown after 1-2 days so squeeze a little extra lime juice if no browning desired. Can be served warm or cold. *Recipe is a guide. Adapt ingredients and measurements as desired. Moms for the win! My mom actually has a similar recipe without the avocado. That addition plus the seasoning is a total game changer. Can’t wait to make it for her.